Satori Athletics Club brings you a race route that takes you through the heart of rural Noordhoek and environs. A beautiful yet challenging 'road' run with a difference. 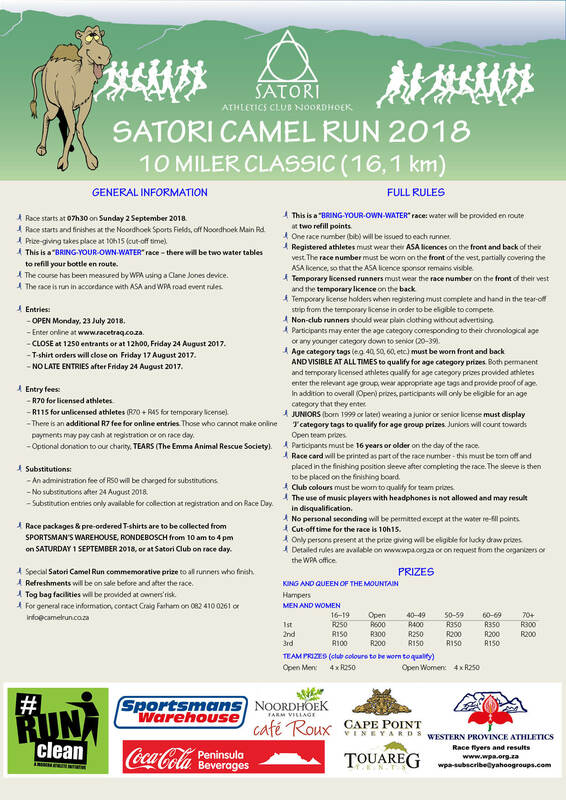 The Satori Camel Run route will lead you past equestrian estates, up the very challenging double hump of Cape Point Vineyards, along shady tree-lined roads and through Ohio Farm and Avondrusvlei Farm where you will absorb our tranquil, country-feel surroundings. This is a "BRING-YOUR-OWN-WATER" race. This is a "BRING-YOUR-OWN-WATER" race - there will be two water tables to refill your bottle en route.